Why not cook the pumpkin you carved for a jack o'lantern? Cube the pumpkin and steam it in a light beer for 20 minutes. Purée the pumpkin and place aside. Sauté a few tablespoons of tomato paste in olive oil over medium heat until they become fragrant. Lower heat slightly and add diced onions, diced green peppers, and chopped garlic. Spice with cumin, paprika, s/p, to taste. Add small amount of beer if needed to prevent scorching. Cook until onions are translucent. Add the pumpkin to the sauté, along with some cooked canned red beans. Reduce heat to low and cook for a few more minutes. Sprinkle with some paprika when plated. Pumpkin GHOULash: start to finish 20-25 minutes, and served with a Brooklyn Oktoberfest. The Brooklyn Oktoberfest was NOT the light beer used for steaming! Use a North American or other international light lager. Submitted as part of Vegan MoFo. disrupt the peace and tranquility of the neighborhood. Four ounces of beer ... four ounces? Would these intolerant folk be the 'real' Virginians? This is an ongoing story in Floyd County, Va.
Jack Curtin writes of an interesting take on the current state of the InBev buyout of Anheuser-Busch. There is an outside chance that the purchase could turn the other way around. Harry Schuhmacher writes in this morning’s Beer Business Daily that InBev will have to pay Anheuser-Busch stockholders the promised $70 a share even if its financing falls apart per an analysis of an A-B proxy statement. There is no contingency “out” for the Belgian brewer. A-B would have a multi-billion dollar claim which would be roughly equal to current InBev value. In this strangest of financial environment, in other words, should the InBev banks bail out, the result would likely be A-B buying InBev rather than the reverse. Several analysts say the gargantuan buyout has become a heavier burden for InBev. The company's stock has been hit by slumping stock indices, a stronger dollar and the prospects of a big stock offering that would dilute shareholders' ownership. InBev shares have dropped by more than a third since the A-B deal was announced in mid-July. A-B is now worth twice as much as InBev by market value — the stock price multiplied by the number of shares. The Belgian company looks like "a minnow swallowing a whale," Gimme Credit bond analyst Craig Hutson wrote last week. InBev's shrinking value meant it would have had to flood the market with shares to reach $9.8 billion. Its main shareholders in Belgium and Brazil would have lost control of the brewer. The plan was shelved two weeks ago. Martyn Cornell is a blogger on beer in the UK. He nom de blog is Zythophile. One of his stocks in trade is identifying (and correcting) beery canards. Another is researching British beer styles (and correcting errors of record there). 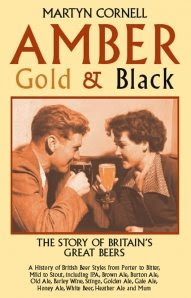 Cornell blends both pursuits in his newly published ebook— Amber, Gold & Black: The Story of Britain's Great Beers. I'm having great fun reading it; I've already been disabused of several personally held beer-myths. There enter in, for Drink well brew'd and clear. For Ales well-colour'd, and stout humming Beer"
There's that which drowns all care, stout beer. Beer sales may have increased since the banking meltdown, but the winter holiday season will be the tale of the tape for beer and wine sales and, of course, for all of retail. Anecdotally, hiring is less than it was last year. And, as commercial credit remains tight (just where did that $700 billion go), many stores may not be able to afford to fully stock their floorspace. Maybe A.E. Houseman was on to something. In going through old papers, I found a résumé of mine from the mid 1990s. The cover letter expressed my conception of a brewpub brewer's job description. I insist upon a savage dedication to the quality of, and the culture surrounding, the beer I produce. Beer in a brewpub must be more than just a product and more than simply a means to an end. This is what I refer to as the beer culture. I have a great respect for beer and wish to work in an environment which engenders such an attitude. If a brewpub insists upon simple gateway/training-wheel beers, it has lost the battle to a non-brewpub which serves Budweiser or Coors Lite. Those large breweries produce these bland styles for low cost and with amazing consistency: qualities most small breweries cannot match. The head brewer should be intimately involved with the design, purchase, and installation of equipment. I have been in brewpubs where the staff, including the bartenders and the management, knew very little about the beer they attempted to sell. How can one expect to market anything, let alone beer, if one does not know what that product is? The head brewer, therefore, should be the bar manager. He should create and implement a beer training seminar for ALL the staff, with ongoing sessions for the servers and bartenders. The head brewer should have the ability to consistently produce distinctive and well-made beers. He should understand how to faithfully reproduce the standard styles. A brewer needs to know, and know well, the basics before he experiments with different directions. The brewer must understand the effect of his ingredients on the finished beer. He must understand the effect of procedures, equipment, yeast, and spoiling microbiology. The brewer must implement rigorous quality control protocols, including micro-biological. The brewer must have a good palate and be able to discern and understand the source of appropriate and undesirable flavors. The brewer must understand the practical side, the business side of beer: sales, production planning, purchase, maintenance, and retrofitting of equipment, quality control, management of personnel, inventory control. Whew! Strong words, but a clear statement of philosophy. Overall, I still agree, nearly 15 years later. Only now, I would state it in a more polite manner. On my recent birthday weekend, I toured Buffalo Trace and Woodford Reserve, two distilleries in Kentucky. They lie along the Kentucky Bourbon Trail, a collaborative effort between the state of Kentucky and the distilleries and their association. A successful tourism program and business-builder, the 'trail' is a matrix of road signs, glossy brochures, and maps. Here in Virginia, the distillery industry is a nascent one. But there is a Virginia Wine Trail and an active wine makers association. Sadly for Virginia beer, there is no association (even though there had been one in the 1990s). There is news, however, of a possible beer trail, at least for the central and southwestern regions of the state: Beer Trail hopes to emulate Virginia wine industry. My colleague at Musings Over a Pint writes quite often on the Virginia beer scene. I'm certain he'll be posting if the beer trail approaches completion. More about my short tour of the Bourbon Trail tour here. Photos here. Sean Wilson —past coordinator of a successful effort to unlimit the allowable alcohol levels for beer in North Carolina, Pop the Cap— has plans to open his own brewpub in Durham, North Carolina. 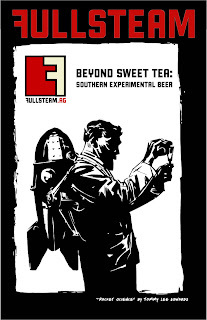 We’re going with the fullsteam dot ag to help spread this message of beer-as-agriculture, particularly as we will rely heavily on local farms for flavoring components. Plus, the .ag is a little “out there” and unexpected. To many people, beer is some kind of mystery beverage produced in industrial vats. In fact, we’d argue that beer’s recent (past forty years) image problem is, in part, because people don’t understand how it’s made. Wine? That’s crushing grapes. Even neutral spirits like vodka…well, that’s potatoes (sometimes, not always…but that’s what people think). Try this sometime. Pick someone randomly and ask them what beer is made from. Well, not too random…avoid asking anyone wearing a “support your local brewery” t-shirt, bearded men, microbiologists, and people who regularly swim in rivers. The brewery industry continues to struggle to get the word out that beer is an agricultural product, made from grains, a vine (technically bine) that produces flowers, water, and live yeast. Maybe Full Steam will be one brewer's analogue to The Omnivore's Dilemma. I'll be waiting for it — intrigued and thirsty. In the early 1990s, Ed Janiak was a part-timer at the Oxford Brewing Company in Linthicum, Maryland. I met up with Ed this past weekend in Baltimore, Md. at the Chesapeake Real Ale Festival. He reminded me of how I had trained him to coax good beer from Oxford's creaky old brewhouse. Oxford had no augur to bring the grain to the mash tun, nor an automated mixer. So, as hot water was sprayed in, brewers would hoist eighteen or so 55 pound bags of crushed barley up onto the platform, and would empty each bag, one by one, into the hopper suspended above the tun. As with any mashing regimen, if there was too much grain the mash would be too thick, forming doughballs, and if too little, the mash would be diluted. I might tweak the flow a couple of times and occasionally I might climb back up the platform and encourage a good mix with a slow stroke of the long wooden boat oar that doubled as the mash fork. But then —and this is what Ed reminded me of at the Fest this past weekend— I would climb down the platform, pop a cassette tape (yes, cassette) into the boom box, and begin to groove to acid jazz tunes. The point I made to Ed was to let the mash be, to allow the mash just to happen, to allow it to be ... an existential mash. In a way, it's the same with cask ale. Cask ale (and kellerbier, that is, cask lager) is beer that has not been fussed with. There's no extraneous handling, no filtering. At a brewery, it's put in a cask while still fermenting, straight from the fermenter. And it's served soon thereafter —unlike wine— young and fresh. Ed and I reminisced over cask ales on a clear crisp October day at the 5th annual Chesapeake Real Ale Festival, at the Wharf Rat Brewpub in downtown Baltimore, Md. All the casks were served by simple gravity tap. Those indoors were cooled with ice blankets. Those outdoors, the majority, had been cooled while sitting outside overnight, covered with tarps. There was some worry that the afternoon sun might overheat the casks, but by mid-afternoon long shadows had prevented that. Which among the 30 or so casks was my favorite? At a recent beer dinner, a table mate asked me, out of all beers I may have ever drunk, what was my favorite beer. I replied, fresh beer, adding that I'm constantly being thrilled by new discoveries and delighted by beers' fresh flavors. But she seemed displeased that I had not limited myself to only one. Thank you to Wharf Rat owner Bill Oliver and Steve Jones, brewer, for hosting the event. Thank you to the Society for the Preservation of Beer From the Wood (S.P.B.W.) which organized and ran it. As a fellow reader noted, David Turley has gone legit. 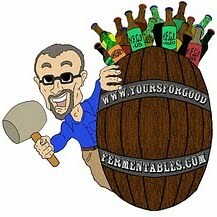 David is the author of an informative beer blog called Musings Over A Pint. Based in Fredericksburg, Va., David covers the Virginia beer scene, and 'muses' on the world of good beer in general. Just over a year old, his blog now has a web address identical to its name: www.MusingsOverAPint.com. Go have a look ... and bookmark it. David Turley (r) , writer of Musings Over a Pint blog. Northern Virginia Summer Brewfest, 22 June 2008. The return of SAVOR in 2009 —a 2 day celebration of beer and food— was announced at the Great American Beer Festival. Bradley Latham of the Brewers Association has told me that the 2009 iteration will indeed return to Washington, D.C., but this time for one night only —May 30, 2009— and at the National Building Museum. Brewery registration will open in early December 2008. Photo courtesy of Chuck Cook. At Busboys and Poets yesterday evening, the guest speaker was running late. Chris O'Brien —the author of Fermenting Revolution. 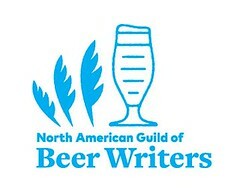 How To Drink Beer and Save the World— was scheduled to speak on organic, local, and sustainable beer at the Arlington, Va. bar/coffeeshop/bookstore. But patrons were happy to wait, sipping on organic beers from Clipper City/Oxford and Otter Creek/Wolavers. Representatives from both breweries were there to discuss their beers. Chris did soon arrive (only a few minutes off schedule), and a small but appreciative group listened. He was late because of that bane of modern urban life: traffic. In a way ironic, that was indeed one point of his talk (and book) that evening. I'll be tapping a fresh cask of Clipper City Brewing's Winter Storm as part of a Nor'easter Beer Dinner at Chadwicks Restaurant, Old Town, Alexandria, Va. Tuesday evening, 14 October. Tom Cizauskas, long-time sales rep for Clipper City, tapped his final keg for the Baltimore brewery in July. As of Aug. 1, he's working for Select Wines, the northern Virginia wholesaler that carries Clipper City beers among many other brands. The beer paparazzi caught up with my mother. [At breakfast's conclusion] A very satisfied Gene Cizauskas asked the waiter, "Does anyone walk out of here?" Pub closures across Britain have accelerated to five a day during the first half of this year, according to new figures. Pubs are now closing at the rate of 36 a week. <..> The current closure rate is 33 per cent up on 2007. <..> A total of 1,409 pubs closed for the last time during 2007. While we should be pleased that real ale is declining slower than the rest of the beer sector as a whole, it is still in decline — which is something which should still concern us. Across the pond, here in the US, we have an abundance of beers available to us: American and international. Enjoy this bounty of good beer. But ultimately: support your local brewery. Local beer —all things being done well— will be the freshest beer one can obtain. Drink local, drink fresh. And, if the beer isn't as good as it should be, stop in the brewery and tell them so. That's something you can't do with the corporate behemoths. There was a a "car-free diet" booth Saturday at the Mid-Atlantic Oktoberfest. Set up by the County of Arlington, the program has a companion website at www.CommuterPage.com. Subtitled "Transportation options for the Washington, DC area", it's a trove of public transportation schedules, maps, links, 'how-to advice', and other resources. I'm a beer and wine salesman. I transport beer and wine and kegs. Thus, I may not be able to go 100% car-free at work. But a side-consequence of my recent job change should be the reduction of my annual car mileage by 2/3. At the least, that's a start. There's another way to be kind to Mother Earth. Drink beer, be it local, sustainable, or organic! Award-winning author and local businessman Chris O'Brien has written the book on that topic —literally. On Wednesday, 15 October (5-7 pm), Chris will be at Busboys and Poets @Shirlington in Arlington, Va. to present a short lecture on organic beer and to sign copies of his book — Fermenting Revolution: How to Drink Beer and Save the World. Representatives from Clipper City Brewing of Baltimore, Md. and Wolaver's of Middlebury, Vt. will be on hand as well to discuss their respective breweries' organic beers. The beers will be priced 'Happy Hour'. There's more information at Beer Activist. In the spirit of Vegan Mofo —Vegan Month of Food— I'll add that beer is a wonderful foodstuff. And, except for some cask-conditioned ales, it's vegan. A bizarre thread has surfaced on a Washington, D.C. area blog. It concerns the venerable Brickskeller, run by Dave and Diane Alexander, and, before that, by Diane's family. Though you won’t see a “For Sale” sign out front or a listing for an open house this Sunday, the Brickskeller is officially on the market. Randall Hagner Ltd. Showcase lists 1523 22nd Street - the “Brickskeller Dining House and Inn” - as being available immediately for the low, low price of only $12.5 million (down from $15 million a week ago). The best way to find it from the home page is to do a search for properties in ZIP Code 20037. The entire five-floor building is for sale, including 40-plus guest rooms on four floors and the two-floor restaurant/bar. The alcohol license will convey to the new owners, but you won’t be able to keep the memorabilia or even the Brickskeller name - the current owners will be holding onto those. Who came up with this? I would like to know since my wife and I OWN the Brickskeller and are NOT SELLING IT. This post must be removed immediately. The Brickskeller is NOT for sale this is not true. We OWN the restaurant and we also own the word Brickskeller if these lies are not removed immediately you can expect legal action. The Brickskeller Dining House and Down Home Saloon is NOT for sale. I personally spoke with Mr. Nemeyer before I posted this, asking him if the entire building was included in the sale and further asking about what furnishings and materials would convey with the property. He was direct and clear in his answers: the whole building is for sale, including the restaurant/bar on the lower two floors, and although the furnishings and memorabilia will not convey, the liquor license will. If this information is incorrect, I would encourage you to discuss all of this with Mr. Nemeyer directly. Thanks very much for identifying yourself as a writer on the telephone. That’s weak. As the listing was just withdrawn from the market by ownership; I would suggest that you retract the September 25th article. Lastly, you will be hearing from Hagner counsel. The Brickskeller has been the home for too many good beer epiphanies to see things spiral into vituperation or worse. Its very success as an advocate for good beer —since 1957 (!) when good beer was an endangered species in America —has been a major spur and nurture to the wonderful world of craft and imported beer now open to all of us. Catching up on some odds and ends this morning. Pictures from a dinner: Rob Tod of Allagash Brewing at Tuscarora Mill in Leesburg, Va. The New York Times does Oktoberfests. Not to be outdone, the Baltimore Sun also did Oktoberfests. Oktoberfest at Shirlington, Va., Saturday 4 October: I'm bringing beers from 8 breweries. Tap & Vine, a new beer & wine pub, has opened in Arlington, Va.